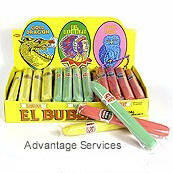 Bubble Gum Cigars 36ct - $16.50 - The Non-Tobacco by Swell Candy Co., 36 individually wrapped Bubble Gum Cigars. Bubble Gum Cigars are 5 inches long and come in 3 flavors - banana, apple and fruit. 36 individually wrapped Bubble Gum Cigars.